Today Google announced the launch of a Mobile-friendly test tool to see if your website passes Google’s criteria for what it consider to be a mobile optimized site. In case you’re wondering why it’s important to meet Google’s mobile-friendly criteria, it’s because they’re adding a “mobile-friendly” label in its search results next to sites that pass this criteria. Since this is a brand new addition, there’s no way to know how it will affect click-through rate, but I think it’s a safe bet that mobile searchers are going to visit a page labeled “mobile-friendly” before visiting a page without that label. With that being the case, you could potentially be turning away mobile visitors and/or be ranked down in mobile search by not meeting Google’s criteria. This change will be rolled out globally over the next few weeks, so don’t worry, you still have time to get your site up to speed. If all of that applies to your site, then a “mobile-friendly” label is most likely in your future. 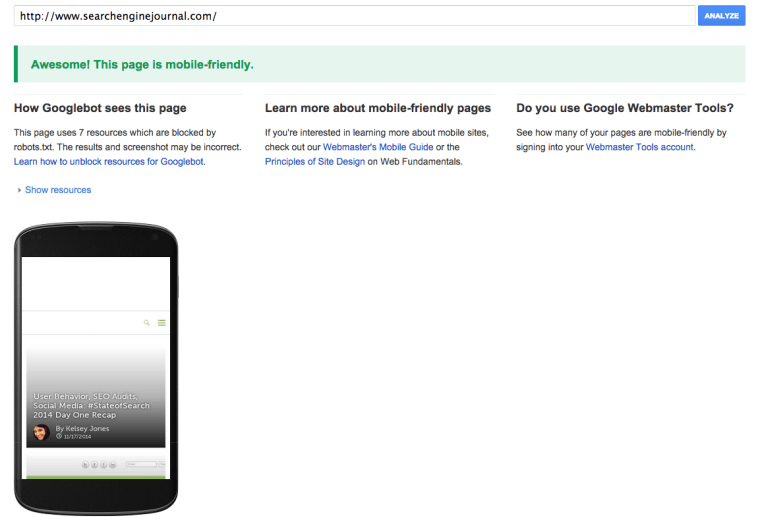 If you’re not sure if it applies, take Google’s mobile-friendly testing tool for a spin. The tool is currently only available in english, but will be rolled out worldwide over the next few weeks.